WSA is rewarded as ITTF Academy! A perfect sensation – the Werner Schlager Academy is officially honoured with the „Academy Status“ of the ITTF International Training Centre Network. Only the WSA is evaluated on the same level as Shanghai! Read more … WSA is rewarded as ITTF Academy! Some of the players of the (inter-) national training group of the Werner Schlager Academy have made partly big steps forward in this month’s ITTF World Ranking. The WSA Table Tennis School is an international table tennis school for hobby and club players who like to improve their playing skills in a high-standard training. Tom Lodziak, coach and player from Cambridge, UK, visited us in May and reported in an interview about this experience. Last week, the Youth Top 10 took place in Romania. From the WSA, Marie Migot, since this year players for SVNÖ Ströck participated in the event and she returned home with a great success. At this year’s Polish Open in Warsaw from 21.10-25.10., not less than 30 WSA-players will show their abilities. Some of the players from the (inter-) national training-group of the Werner Schlager Academy made an enormous improve in the recent World Ranking. The players of the (inter-)national training group of the Werner Schlager Academy in Schwechat celebrated big victories at the just finished European Championships. At the day after the Team-Event, the contest went on for those WSA-players who were not seeded in the main event. The team-event couldn’t have come to a more thrilling and from the Austrian point of view more successful end. Since 2013 Christian Scheiber, born in Burgenland, practices at the Werner Schlager Academy in Schwechat. Already 3 times in the past he won the national championship in class 7. What an extraordinary success. Now he has a new goal in mind and therefore needs your support: the Paralympics 2020. All the persons responsible and especially the participants of the first European Women Table Tennis Seminar that took place from Monday to Wednesday in the premises of the Werner Schlager Academy in Schwechat summed up euphorically. Lily Zhang, the latest gain of the international women-training-group of the Werner Schlager Academy and the new starlet of the WSA-partner-club SVNÖ Ströck will come to Schwechat these days with a lot of self-confidence. In Schwechat, Lily will have her permanent training-homebase in the future. On Monday September the 7th the Werner Schlager Academy in Schwechat experiences another highlight. Besides the regular operation of the (inter-) national WSA-training-group, the world-table tennis training-center in the heart of Europe has special visitors. Two hot-spots will take place at the same time, next door to each other in the premises of the WSA. The Women Table Tennis project of the Werner Schlager Academy causes a ripple effect. The situation was not that promising in the beginning. In the first round of the current Champions League season 2015/2016 our team, SVNÖ STRÖCK, could not deploy the new Japanese star player Sayaka Hirano (due to a shoulder injury). And the opponent, UCAM Cartagena, was a very hard one in the first match of group B. This August it’s getting hot in Schwechat- not only because of the record-breaking heat that is again forecasted for the next few days and weeks. In fact the air will heat up in the WSA when 90 players burn out themselves completely in their training session. Even though the hall was already fully booked the last weeks, the month of august will break all records. Last weekend a very special encounter took place in chinese Zhangjiagang. The allstars from Europe under the guidance of Ex-WSA coach Richard Prause faced their counterparts from Asia. On the side of the European Team, 2 players were nominated who train and live in Schwechat since many years. These two players were in the end the ones who were crucial for the outcome of the Euro-Asia Allstars Challenge. Read more … USA goes Austria! On the 12th of June 2015 a new major event in sports was brought to life- the first ever European Games started in Baku, the capital of Azerbaijan. This event is similar to the Olympic Games with the one distinction that only athletes from the National Olympic Committees of Europe were authorized to participate. National Champion: He did the triple! 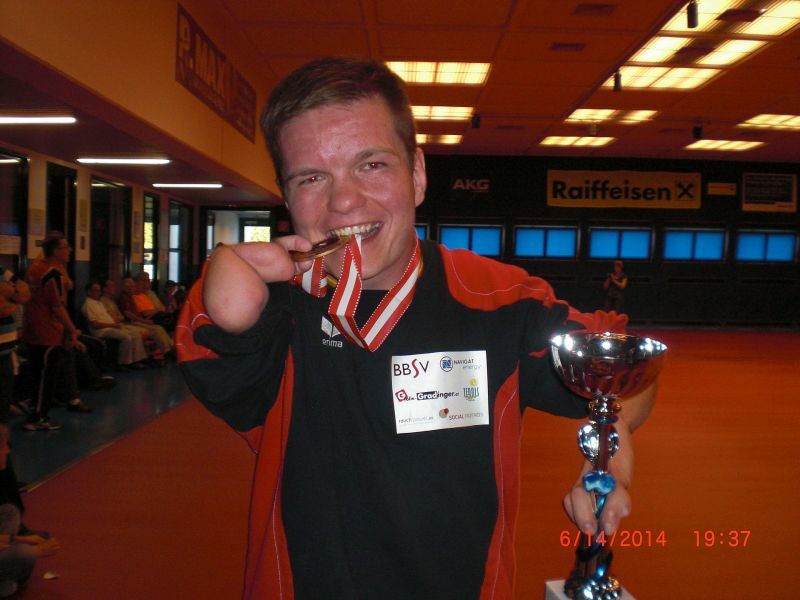 The reigning Austrian champion in table tennis for disabled class 7 Christian Scheiber defended his title and could win the title three times in a row. Read more … National Champion: He did the triple! On Saturday, May 23 2015 the seventh Salzburg Open took place on the Olympic Centre Rif/Hallein. All in all 24 players - invited by the Salzburg club for sports for the disabled – participated in the tournament. 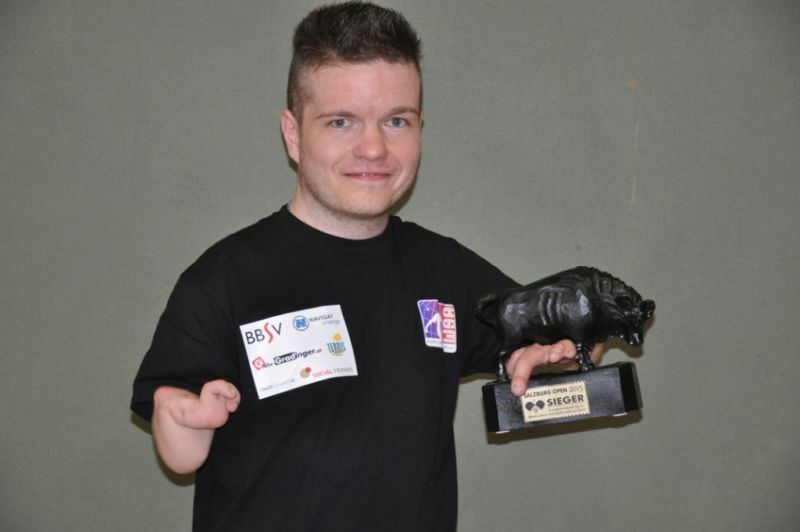 Christian Scheiber represented the Burgenland organisation for the sports for disabled for the second time at the Salzburg Open. 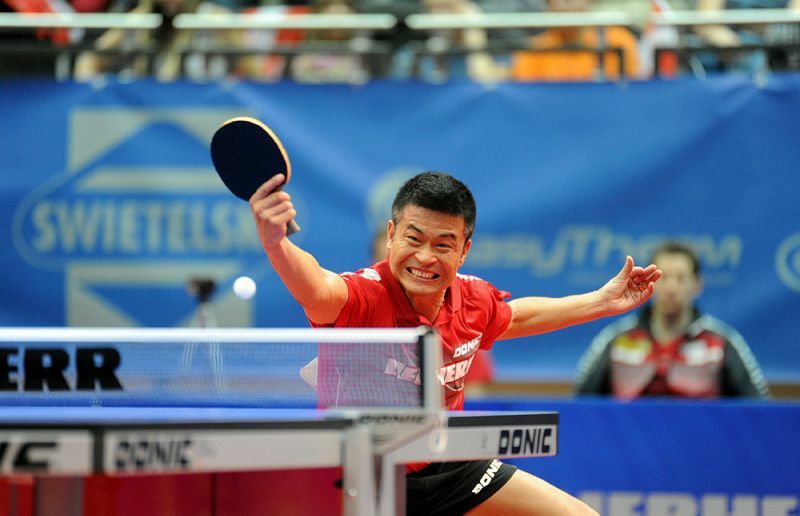 The Table Tennis Championships 2015 break all records! Approximately 450 Million People worldwide watched this years’ Table Tennis Championships in China-a fabulous new record. In China alone 252 million people were interested in the event. 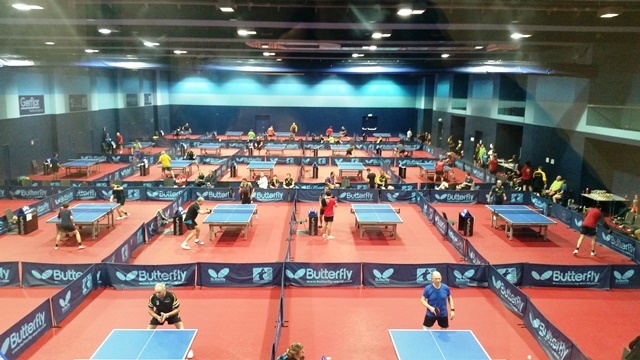 Read more … The Table Tennis Championships 2015 break all records! Big improve by the WSA players in the World Rankings: Many of the players of our international training group made a big step forward in the World Rankings that were published immediately after the World Championships. The ITTF is now the worlds largest international federation. Multiversum/WSA overrun by Table Tennis enthusiasts! A deluge of excited Table tennis players found its way into the Multiversum Schwechat. Reason for that were the 2. Riha Open 2015, organized by the Werner Schlager Academy. How did the round of sixteen evolve for our female WSA-players and who managed to advance to the finals? On day 3 of the main round, only the female WSA players were able to continue on the road to success. UThe World Championships in Suzhou goes on with big steps. The first surprising results have already overcome the table tennis world. Dimitrij Ovtcharov who was supposed to be one of the candidates for a medal was defeated in the second round of the tournament. The eagerly awaited main round of the table tennis World Championships in Suzhou started on April, 28 consistently positive for the WSA-players, as everyone mastered to trigger his or her best performance, thanks to the optimal preparation in the run-up to the event. Therefore most of the players managed to win their first-round games. Richard Prause, WSA Head Coach and prominent representative of the Werner Schlager Academy at the World Table Tennis Championships 2015 in Suzhou, has already flown to the Chinese metropolis on last Wednesday and was on site for the traditional Butterfly evening before the competition starts. 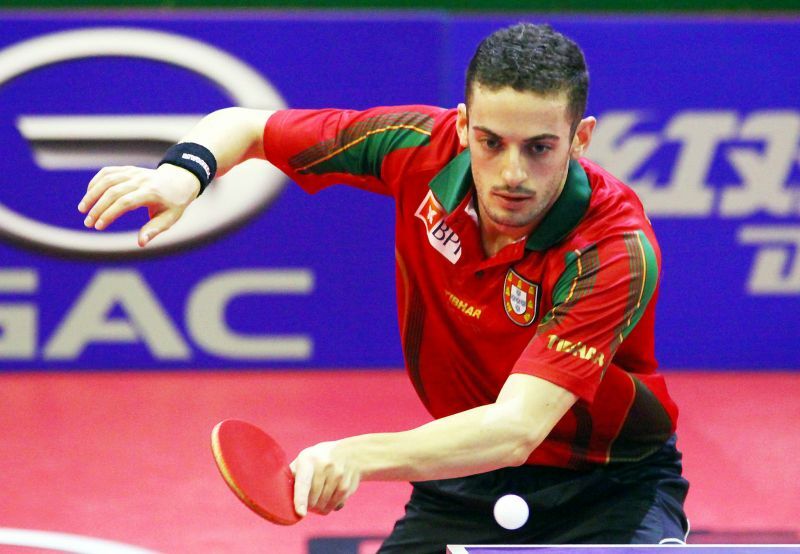 Marcos Freitas, reigning European Team Champion and permanent member of the international WSA training group since 2 years, could consolidate his position among the top players in the world in the latest ITTF world ranking. 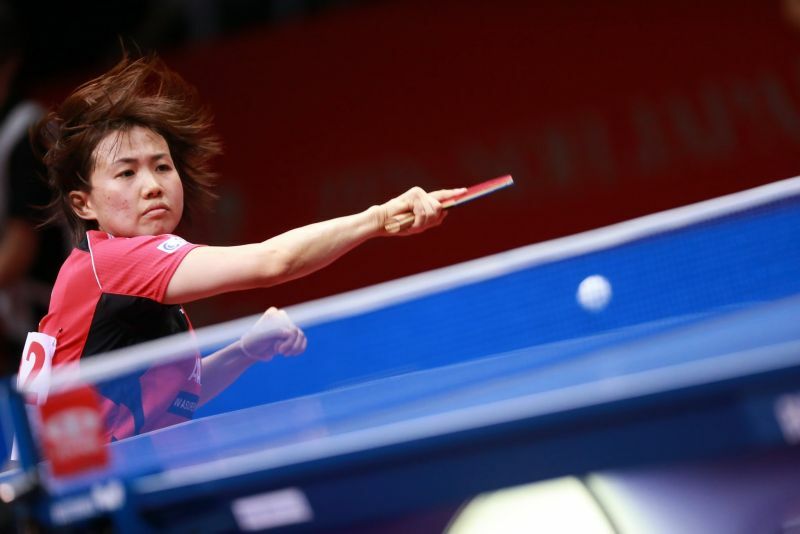 The international table tennis’ highlight 2015 approaches rapidly: the World Table Tennis Championships in the Chinese city Suzhou (April, 26 – May, 3). Again and again the Chinese competitors will be the favourites for the titles and will be hunted by the rest of the world. The Werner Schlager Academy, founded in 2010 and now well established as a world class training centre in the heart of Europe, has now taken a further step forward in widening its range of item on an ever growing itinerary. The „lost son“ returns home to Germany. For almost five years the former DTTB national team coach for the women’s and later for the men’s team has worked in Wien-Schwechat. As WSA Head Coach – together with Düsseldorf’s former Head Coach Dirk Wagner and coach legend Mario Amizic – he built up the world training centre “Werner Schlager Academy” (WSA). WSA-Players (Women) on the rise! Tetyana Bilenko (Ukraine), who has reached the ninth place at the World Championships 2013 in Paris and plays for the reigning Austrian Team Champion SVNÖ STRÖCK, could go upward by 26 places. Reaching the quarter finals at the Qatar Open she improved on rank 62. Read more … WSA-Players (Women) on the rise! WSA-Players (Men) on the top! In the current world ranking published by the International Table Tennis Federation (ITTF) the players of the Werner Schlager Academy (WSA) have sensationally climbed upwards. Read more … WSA-Players (Men) on the top! Qatar Open - WSA is proud of its athletes! Yesterday the Qatar Open ended with the thrilling final between Dimitrij OVTCHAROV (GER) and Vladimir SAMSONOV (BLR). The past master Samsonov could beat Germany’s new number one in 5 games. Besides this result the Werner Schlager Academy is very proud of its athletes who have started for their nations at the Qatar Open! Read more … Qatar Open - WSA is proud of its athletes! YouTube video series "Ask the Coach"
Read more … YouTube video series "Ask the Coach"
From now on the Werner Schlager Academy has its own channel on YouTube! Read more … Visit us on YouTube! Not only in Austria but in the whole (table tennis) world he is well know: Chen Weixing, born in China and Austrian citizen since 2000. The Werner Schlager Academy is going to start the New Year with a very special highlight! WSA partner club SVNÖ Ströck has sensationally reached the Champions League semi-final with the last chance. Some spectacular visitors arrived at the Werner Schlager Academy for the Champions-League match SVNÖ Ströck against Szekszard AC. Finally they made it! With a brilliant performance the SVNÖ Ströck team won their first match in the current Champions League season. Therefore they had to fight hard against the guests from Szekzard AC. Entire 6 players represent the international WSA training group at the „Wisdom Youth World Championships 2014” in Shanghai. After the restructuring the SVNÖ Ströck team started with a rebuilt and rejuvenated team into the new season 2014/2015. The reigning Austrian champion has still two Champions League matches in this year and is willing to fight for the qualifications for either the Champions League semi-final or the ETTU-Cup which was won by the STRÖCK team in the last season. WSA Head Coach Richard Prause was accorded the honour of coaching the European team against the Asian team in the Euro-Asia competition at the following weekend in the Chinese Zhang Jia Gang. 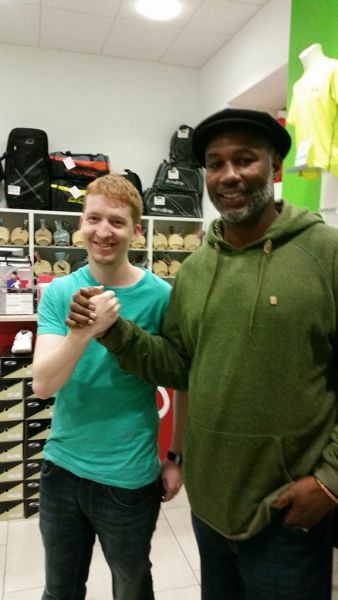 Suddenly Lennox Lewis appeared in the WSA! On Tuesday evening the WSA employees were amazed at what they saw. Suddenly a tall and muscularly stood in the WSA table tennis shop “Go Sports” who just wanted to buy a blade and some table tennis rubbers. Nothing spectacular as one may say. Read more … Suddenly Lennox Lewis appeared in the WSA! WSA’s partner club SVNÖ STRÖCK fought bravely in the first home match of the current European Champions League against the favourite team KTS Zamek Tarnobrzeg (Poland). After more than three hours they lost unfortunately with 2-3 points. At the Men’s World Cup in Düsseldorf (24. – 26. Oct) the international training group of the Werner Schlager Academy (WSA) is represented by two famous players: Austria’s number one Robert Gardos and Portugal’s newly European Team Champion Marcos Freitas. WSA partner club SVNÖ STRÖCK is confronted with a big task – the home match premiere in the new Champions League season 2014/2015. On Monday, Oct 27, 2014 (19.00 / 7 p.m.) the Austrian Champion and reigning ETTU-Cup Winner SVNÖ Ströck welcomes the Polish Champion KTS Zamek Tarnobrzeg. Neven Cegnar, who has been Croatian national team coach for 23 years and mainly responsible for the success story of the former world no. 2 and bronze medallist Tamara Boros, will reinforce the WSA coach team in July 2015. 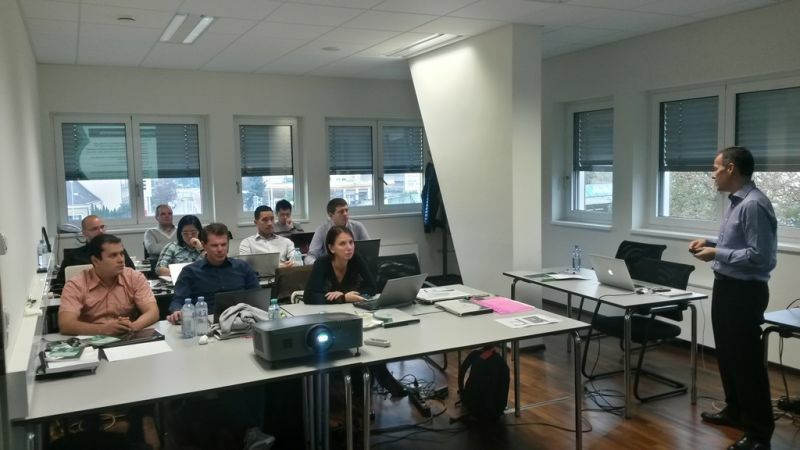 In the last week the ITTF hosted a ITTF Competition Manager seminar from 6th to 8th October at WSA in Schwechat. Prospective Competition Managers from all world participated in the 3-day event. WSA Table Tennis School ready for 2015! Just in time the WSA Table Tennis School has finished the scheduling for 2015. 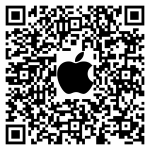 From now on we publish our new schedule, flyer and concept online on our website. 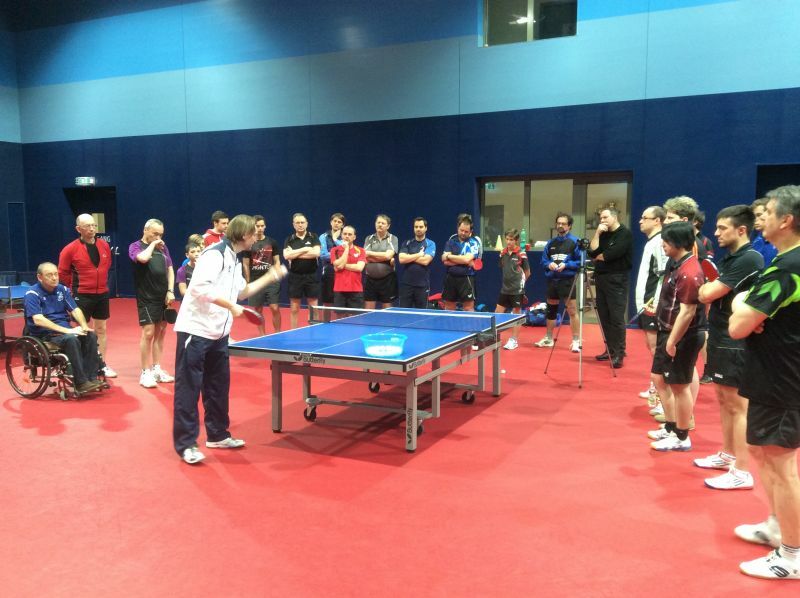 Read more … WSA Table Tennis School ready for 2015! A great victory has been achieved by a young player, who has recently joined the international WSA training group in summer 2014. Lea Rakovac, 17-year-old Croatian who plays in the season 2014/2015 for the Austrian national champion SVNÖ STRÖCK, won the European Top 10 tournament. The athletes of the Werner Schlager Academy were able to celebrate great successes at the European Table Tennis Team Championships in Lisbon, Portugal. Andre Levenko wins the Croatia Open! Andreas Levenko is making headlines in Varaždin (Croatia). The rookie from the Werner Schlager Academy was in a dramatic final able to decide the Croatia Junior Open for himself, and win the first major title in his career. Read more … Andre Levenko wins the Croatia Open! 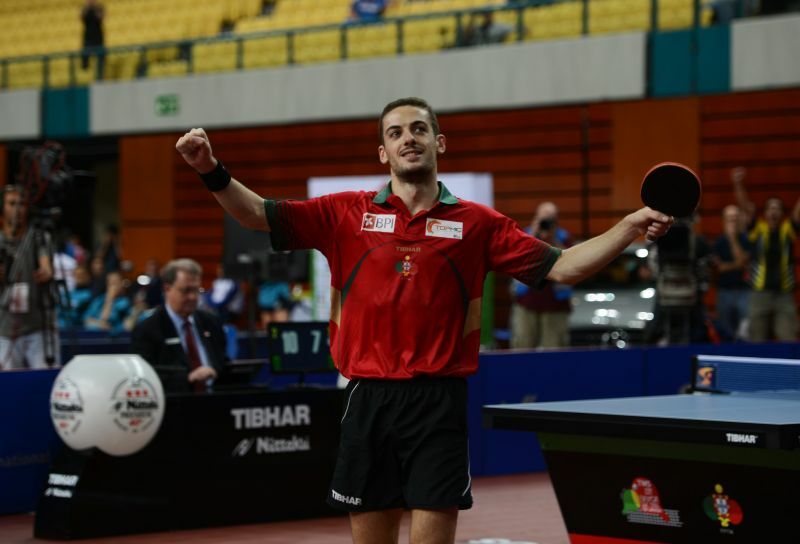 5 female and 5 male players - this is the contingent's limit for every nation at the Table Tennis European Team Championships (24th - 28th September 2014) in Lisbon. Consequently the Werner Schlager Academy (WSA) located in Schwechat / Austria will have the biggest team in the competition. With great pleasure we announce that the Werner Schlager Academy (WSA) and the City of Schwechat have signed a long-awaited cooperation agreement, which grants a maximum of peace and security for all project partners in the next years. 5.000 and no end in sight! The Facebook site of the Werner Schlager Academy was able to set another record and broke new barriers. Read more … 5.000 and no end in sight! Marcos Freitas wins Czech Open 2014! The new season 2014/2015 begins for Marcos Freitas exactly like the last season has ended: with a huge success! The 26-year old Portuguese won the Czech Open in Olomouc and was able to celebrate several premieres. Read more … Marcos Freitas wins Czech Open 2014! Werner Schlager Academy is very proud of “WSA-Baby” Tamolwan Khetkuen who has participated in the Youth Olympic Games in Nanjing, China from 16th till 28th August. Tamolwan – nickname “Mo” – has practiced at Werner Schlager Academy continuously since 2010 and had no problems to qualify for the Youth Olympic Games in Nanjing. Read more … Bravo Mo! Werner Schlager Academy participates with a real strong „team“ in the Youth Olympic Games in Nanjing (China). Six players who practice regularly at WSA will fight from August 17th till August 28th 2014 for the desirable Olympic medals in the Chinese metropolis. It is one of the biggest events for the countries that has belonged and still belong to the British Commonwealth: The Commonwealth Games 2014 in Glasgow. All in all 17 sports participate in this fantastic event and our WSA-player Danny Reed could achieve two medals in table tennis. The likeable right hander, who has practiced regularly at WSA since one year, has won two medals for England, one in the mixed and one in the team competition. Werner Schlager Academy (WSA) in Schwechat has started a spectacular collaboration with the Chinese metropolis Chengdu-Xindu this week. The cooperation started with a one-week training camp from a group of young Chinese players. Coach of the group was the well-known Olympic champion in 1988, Chen Longcan. In a total of 11 competition classes the Austrian disabled championships were held in Stockerau last weekend. "It's so wonderful," was the statement of the visibly relieved players from Qatar after landing at Vienna's Schwechat airport. At a temperature difference of about 20°C this is well comprehensibly. The table tennis team of the "ASPIRE Academy for Sports Excellence" will be a guest at the Werner Schlager Academy. Great day for WSA partners club SVS STRÖCK. The team secured in a duel with the freshly baked French champions Lille Pongiste the victory in the ETTU Cup and gained the first major international title in the first four years of club history. In less than a year after the start of the Werner Schlager Academy on July 26, 2013 in the world's largest social network, today a new "milestone" of "Likes" is scored. Read more … 4000 cracked! You realize Summer Youth Olympic Games 2014 (August 17 to 28) of Nanjing ( China) coming closer and closer, not least at the well known names of the training guests at the Werner Schlager Academy in Schwechat. 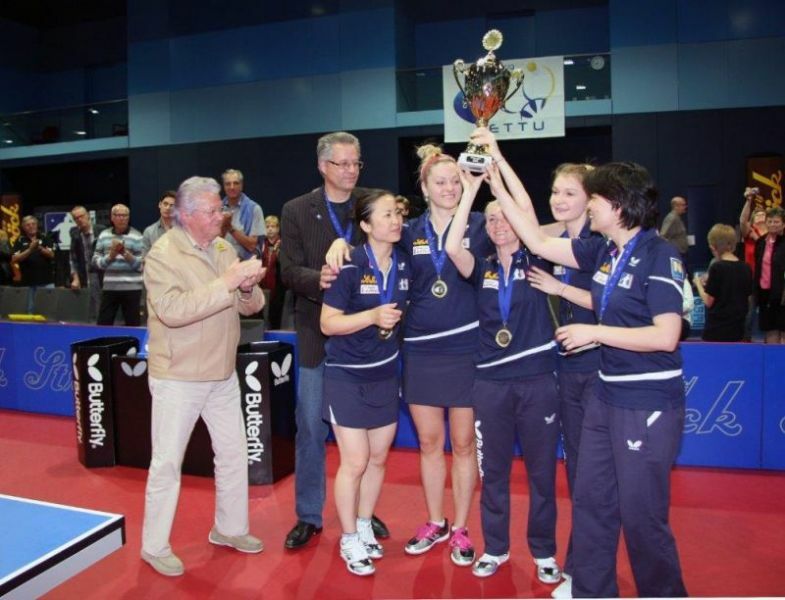 A few days before the first ETTU Cup final against Lille the SVS Ströck girls presented themselves in top form despite the stresses and strains at the World Team Championships in Tokyo (Japan) and secured the title in the easyTherm table tennis national league. This was the "Barrel Tournament"
Read more … This was the "Barrel Tournament"
There was good news for some players of the Werner Schlager Academy after their success at the World Team Championships in Tokyo (Japan). The latest Men and Women ITTF World ranking is published yet. China's table tennis aces (again) left their mark at the World Team Championships in Tokyo: first the Chinese men could beat Germany 3-1 in the final and then the women from the Middle Kingdom completed the double gold. But also the Werner Schlager Academy is one of the big winners of the Championships in Japan. 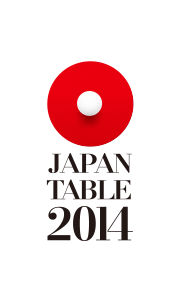 One of the absolute highlights from the perspective of (still) - celluloid aces (note: as of summer 2014 change to plastic balls) are undoubtedly the Table Tennis World Team Championships, starting 28 April 2014 in the Japanese capital. The charismatic superstar is together with the Danish national team at the Werner Schlager Academy in preparation for the World Team Championships in Japan. He also took some time for an interview. See you in Nanjing Andre! After a thrilling match and tears of happiness it was certainty. WSA player Andreas Levenko has just qualified for the Youth Olympic Games in Nanjing (China) from 16th - 28th of August 2014. The 15 year-old Austrian fought hard for the biggest win in his young career. Read more … See you in Nanjing Andre! Werner Schlager and Wang Liqin in an exhibition match . The new world rankings published by the International Table Tennis Federation once again proof the top form of the players of the Werner Schlager Academy. 12 athletes (men and women) of the WSA are ranked within the top 100. The ETTU-Cup semifinal between SVS Ströck and LZ Linz was awaited with great anticipation. Our team showed a great performance with a 3:0 success. However, some little flaws were used by the players from Linz very well. Read more … SVS Ströck dominates Linz! Neven Cegnar - Croatian national team coach for 22 years, won 32 medals at European Championships and World Championships and was coach of one of the best European players ever, the former no. 2 in the world, Tamara Boroš. 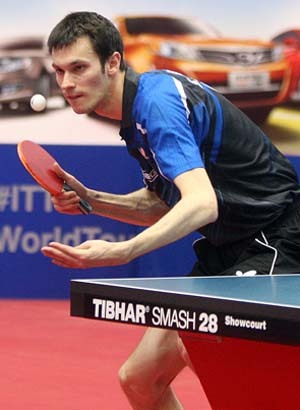 With WSA key players such as Marcos Freitas , Robert Gardos , Alexander Shibaev , Chen Weixing, João Monteiro , Daniel Habesohn and many more , the term " world-class table tennis " was already commonplace in Schwechat. The training schedule for the Club WSA training is changed a little bit. Since launching Facebook presence of Werner Schlager Academy on July 26th, 2013 the number of followers of WSA in the biggest social network incredibly increased. The 84th Austrian Championships last weekend in Dornbirn brought some surprises, and once again proved that as well on national level the Werner Schlager Academy is the measure of all things. Learn from the World Champion! 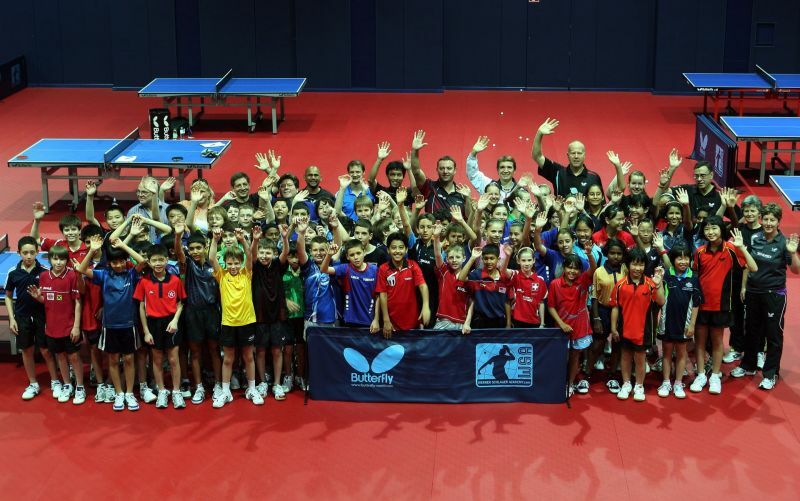 WSA Table Tennis School: Service and Return course with Werner Schlager! 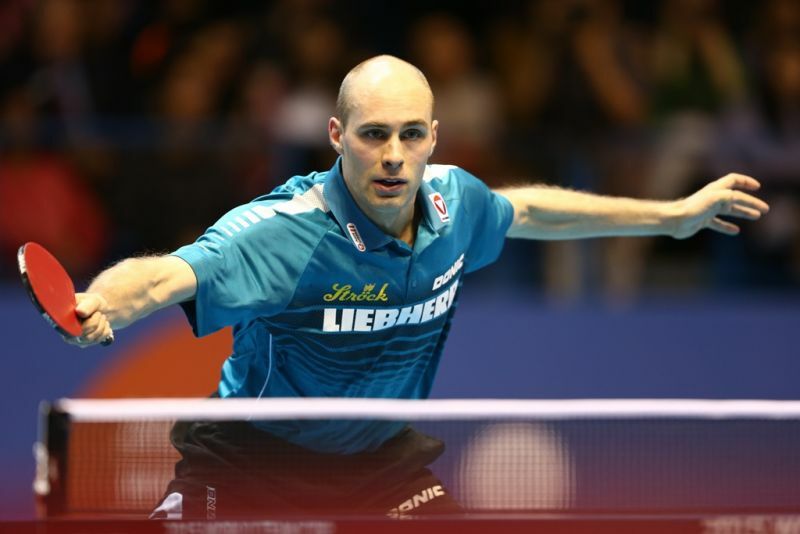 Get tips for the two most important strokes in table tennis from the World Champion. Read more … Learn from the World Champion! Stefan Fegerl, WSA key player of the first hour, followed up on the impressive winning streak of his training partners and won the doubles title of the ITTF World Tour Kuwait Open alongside the Chinese Lin Gaoyuan. After victories over WSA colleague Alexander Shibaev and France hope Adrien Mattenet, Freitas completed the perfect week with the title win in Lausanne. Great success for WSA starter Daniel Habesohn (SVS Niederösterreich). With a perfect total score of 6:0 against Dr. Casl Zagreb WSA partner club SVS STRÖCK has reached the semifinals in Women’s ETTU Cup. The ÖTTV Junior Super League is an Austria-wide 4-tournament series (two tournaments per half year) for junior players, played in several groups. Both the all-important second leg between SVS Ströck and STK Dr. Časl Zagreb in the ETTU Cup quarter-finals, as well as the showdown between SVS Niederösterreich and Vaillante Angers TT to the semi-finals of the ETTU Champions League will be shown live on Sunday and Monday live on Laola1.tv. 94 Players - 187 Registrations - 8 Competitions - 7 Nations These are the numbers that prove that the Niederösterreich Open 2014, which took place at WSA on Sunday, 5th January 2014, were very successful. Considering his age, some players at the various ITTF tournaments could be his grandsons, but the Spanish old pro himself can’t be left on the shelf. Hardly ending 2013, there are already determined the highlights for 2014. 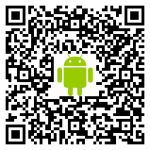 The DHS Europe Cup, from 7 to 9 February 2014 in the city of Lausanne in the Swiss canton of Vaud. WSA partner club SVS STRÖCK has won the 5th CL-round match against Metz TT 3-1 and remains in the running for a place in the Champions League semifinal. It reads like a unique success story. In the summer of 2010, the Women's Table Tennis Club SVS STRÖCK was founded parallel to the imminent opening of the Werner Schlager Academy in Schwechat. National and international players in the WSA training group made great leaps forward in the newly published world rankings of the ITTF. The Werner Schlager Academy is well-known for offering perfect training conditions to players of all levels from every continent and every region around the world. Read more … Austria? No, Australia! Latest rankings of the world federation ITTF are showing due to the European Championships at the Werner Schlager Academy and the Men's World Cup numerous major changes. Watching athletes from over 20 nations playing on 29 tables, the phrase "after the EC is before the EC" probably is no exaggeration. No time to rest for the team of SVS STRÖCK. The European Championships at Werner Schlager Academy were followed by an impressive 3:0 (9:0 set ratio) in the Champions League group stage (Group A) against the French top club Metz TT on Friday. Part I of the LIEBHERR European Championships is complete. The title in the team competition in both the men's and the women's went to Germany. The ( European ) Table Tennis is focused to Schwechat near Vienna. More specifically, to the Werner Schlager Academy, when dated 4 - 13 October 2013 the largest table tennis training center in Europe will be the stage for the stars of the continent. Read more … WE ARE EUROPE . . .
16 players have been nominated by the ÖTTV for the LIEBHERR Table Tennis European Championships (4 - 13 October) at the Werner Schlager Academy in Schwechat. At the Czech Open in Olomouc – a World Tour tournament – the European Doubles Champions Daniel Habesohn / Robert Gardos presented themselves in a very good shape six weeks before the LIEBHERR European Championships at the Werner Schlager Academy (4 – 13 October 2013). Honorable invitation for the new top player of WSA partner club SVS STRÖCK, Tetyana Bilenko. Great success for the WSA player Tamolwan Khetkuen. Tetyana against the rest of the world. . . In September a great task is waiting on the new star player of SVS STRÖCK Tetyana Bilenko. Read more … Tetyana against the rest of the world. . .
Another two months. . . Yet exactly two months - then they will start. The LIEBHERR Table Tennis Championships at the Werner Schlager Academy in Schwechat Multiversum (October 4 to 13) cast their shadow. Read more … Another two months. . .
Great news for the Werner Schlager Academy (WSA) in Schwechat. Two and a half years after the official opening of the World Table Tennis Training Center of World and European Champion Werner Schlager, THE accolade was carried out by the World Table Tennis ITTF (which is with 218 member countries the second largest sports federation in the world). The Werner Schlager Academy is now part of the largest social networks in the world! Read more … WSA goes Facebook! Great success for the young Austrian player Andreas Levenko (Baden) at the European Youth Championships in Ostrava. The table tennis world federation ITTF has produced a new promotional video. Champions League semi-finalist SVS STRÖCK may report the next sensational coup after the new additions of Li Fen (Sweden) and Petra Lovas (Hungary). 60 children from 35 countries, the entire squad of the coaches of the Werner Schlager Academy with Mario Amizic, Richard Prause, Dirk Wagner, Tamara Boros, Aya Umemura, Dmitry Levenko, Mathias Habesohn and Provas Mondal. For the second time after 2011, the Werner Schlager Academy in Schwechat organizes in collaboration with the ITTF and the Butterfly the "World Hopes-Week". 9 - 16 June, the WSA (and thus Schwechat) turns into a madhouse. It was all about the junior players of the Werner Schlager Academy at the Austrian Under-21 Championships in Salzburg. 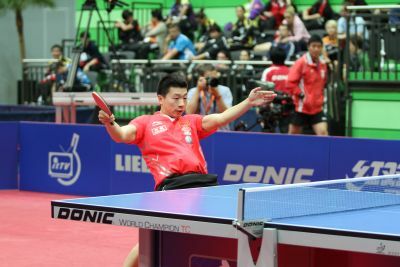 At the LIEBHERR World Table Tennis Championships in Paris-Bercy, the years-long dominance of China was evident again. As part of the LIEBHERR World Table Tennis Championships in Paris-Bercy (all results and detailed reports can be found at www.ittf.com) the Canadians Adham Sharara was elected for another four years as President of the ITTF,..
A few days before the start of the World Table Tennis Championships in Paris-Bercy the Werner Schlager Academy to some extent is like a madhouse. Friday night China's table tennis team arrived in Vienna-Schwechat for the direct preparation for the Individual World Championships in Paris-Bercy (from 13 May). Read more … The guests from "Hollywood"
Austria's women table tennis champion STRÖCK SVS has landed a very "big fish" for the upcoming season. 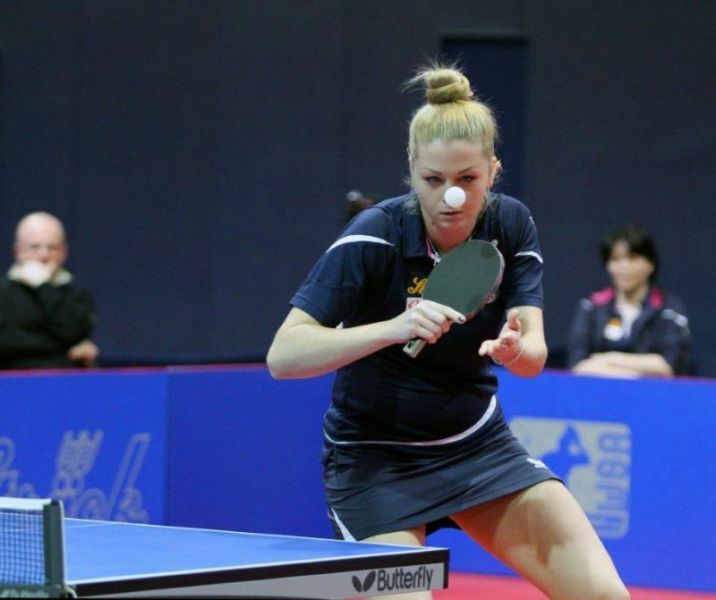 Austria's women table tennis champion SVS STRÖCK, who failed in the 2012/2013 season with an incredible bad luck and due to injury series in the semifinals of the European Champions League on the later winner Linz Froschberg , has begun the rebuilding of the team for the upcoming season. From 13 – 20 May the (table tennis) world is looking to Paris-Bercy. Ten years after the legendary World Championships singles gold by Werner Schlager the World Table Tennis Championships take place again at the same location. For the third consecutive year after 2011 (before the World Championships in Rotterdam) and 2012 (before the World Team Championships in Dortmund) China's table tennis national team comes for World Cup preparations into the Werner Schlager Academy in Schwechat. The Werner Schlager Academy has a new strong partner. With immediate effect, the WSA is working together with EUROTOURS INTERNATIONAL. The ITTF has released its latest team rankings. The players in the (inter) national training group of the Werner Schlager Academy significantly have improved in the recent ITTF World Ranking. During a press conference at the Vienna Marriott Hotel, the representatives of the European Table Tennis Union (represented by ETTU President Stefano Bosi), the Austrian Association (with President Dr. Gottfried Forsthuber) and the Werner Schlager Academy (CEO Martin Sörös) signed a cooperation agreement for the Table Tennis Championships (4 to 13 October 2013). SVS STRÖCK star Daniela Dodean returns exactly four months after her serious knee surgery on 5 December 2012 to competitive table tennis sports. Lukas Plöchl - Entertainer, Austro-rapper, stage hog. For about three years the 23-year-old Upper Austrian is a fixed star in the Austrian music business. 3 - 10 May China's national team will come for the third time in series (after 2011 and 2012) for World Championships’ preparations to the Werner Schlager Academy in Schwechat. Two players of the Werner Schlager Academy have been nominated by the European Association ETTU for the comparison fight "Euro-Asia" on 16 / 17 March in Qingdao: Marcos Freitas (Portugal) and Chen Weixing (Austria). Good news from the Werner Schlager Academy in Schwechat: Double European Champion Daniela Dodean, since the summer of 2010 at home in Schwechat and star player of WSA Partners Club SVS STRÖCK has, Friday for the first time after her severe knee surgery, contested table tennis training. 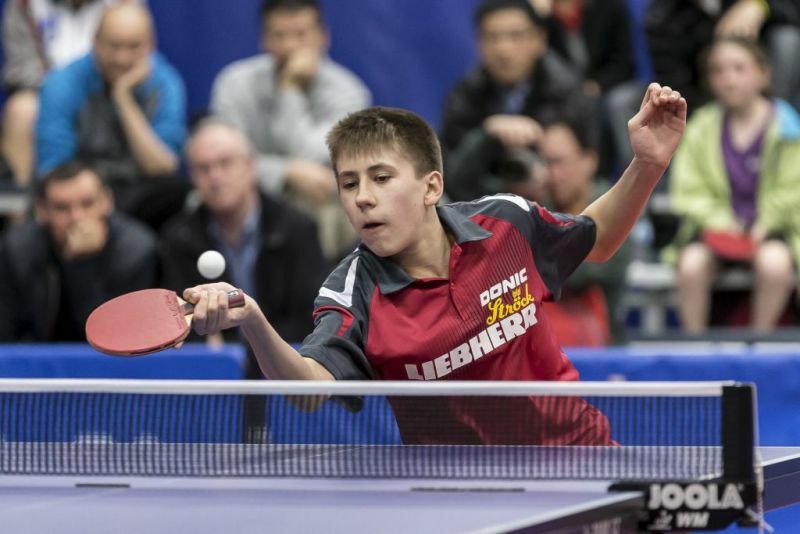 Some great improvements for the players of the Werner Schlager Academy in Schwechat brought the newly published March World Ranking list of the ITTF. From 4 - 13 October the European Table Tennis Championships take place at the Werner Schlager Academy in Schwechat. The Werner Schlager Academy in Schwechat once again will be the center of the (table tennis) world. This time the kids are in focus. The chance for SVS STRÖCK to continue the unbraked skyrocketing of the last two and half years was not given already before the Champions League semifinal against Linz AG Froschberg. Good news for two youngsters from the training group of the Werner Schlager Academy. 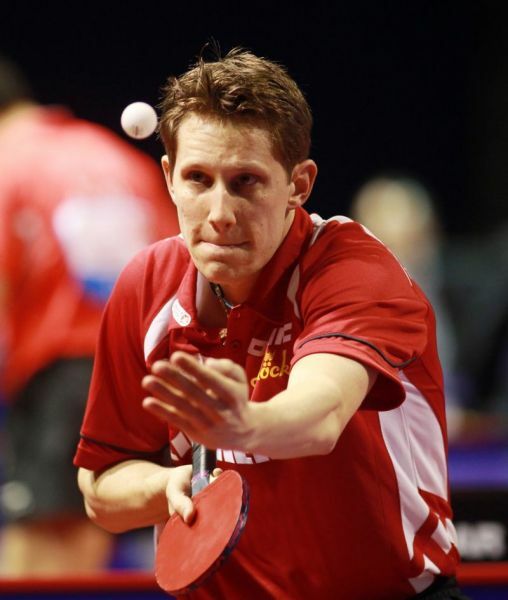 Ten years after the historic World Champion title of Werner Schlager the Table Tennis World Championships in a few weeks (13 - 20 May) return to Paris-Bercy. To that legendary site where the Austrian table tennis star became a globally recognized icon. A veritable parade of the greats of table tennis from the ITTF is taking place these days in the Werner Schlager Academy (WSA). The spirit of the best table tennis players in the country will be found this weekend in the Werner Schlager Academy (WSA) in Schwechat. The ITTF has released its latest world rankings. Only now have statistics been released on the results of the European Association STRÖCK Youth Championships in July 2012 held in the Werner Schlager Academy in Schwechat. The 1st spring round robin of the Austrian Women's National League will take place - as the ÖTTV has now decided - on 12 / 13 January at the Werner Schlager Academy in Schwechat. WSA Partners Club SVS STRÖCK sovereignly secured the winter crown in women's national league and after half of the championship's almost reached the first major season goal (reaching the final tournament for the TOP 4 of the Austrian Championship title). WSA Partner Club SVS STRÖCK reached on sovereign way the semifinals of the European Champions League. 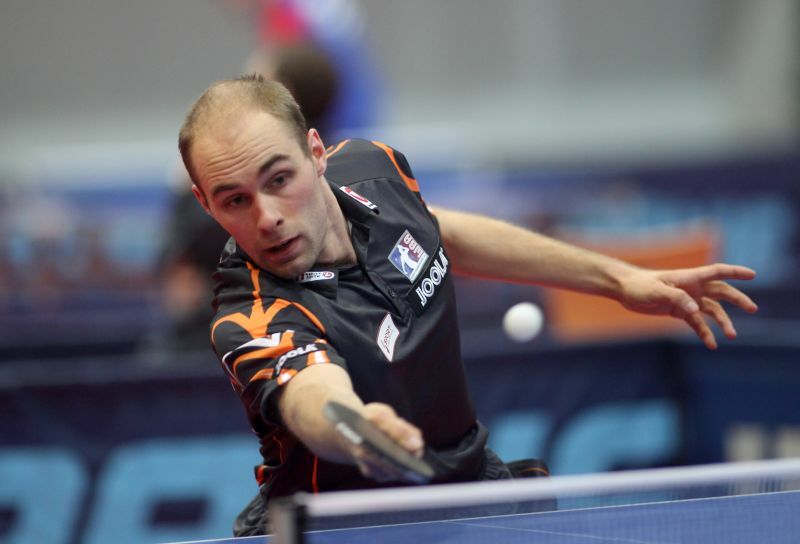 Stefan Fegerl (SVS Niederösterreich) has improved enormously in the recent World Table Tennis Ranking. Austria's women table tennis champion STRÖCK SVS is an increasingly popular target object of national and international television. From 7 - 9 December the ETTU Trainer Seminar is held In the Czech Pilsen. The Werner Schlager Academy will be represented most prominently by our Star coach Tamara Boros. Once again, high attendance in the Werner Schlager Academy. The stars of the Russian elite team UMMC Verkhnaya Pyshma have pitched their tents in Schwechat. WSA partner club SVS STRÖCK has been playing great in the national league round robin in Villach. WSA partner club SVS STRÖCK remains in the Champions League season 2012/2013 on the road to victory. The ITTF has released the latest computer-doubles world ranking. Daniela Dodean, player of the Champions League finalist SVS STRÖCK, could qualify at the tournament of the last chance, the Polish Open in Poznan with her Romanian double partner Elisabetha Samara for the World Tour finals in Hangzhou, China (6 – 9 December). Nice image promotion for the double European champion Daniel Habesohn: The SVS Niederösterreich player who has improved exorbitantly since the foundation of the Werner Schlager Academy, reached in the choice to Lower Austria's athletes of the year 2012 the excellent second position. She was almost like a child in the first hour at the WSA in 2009, as part of our "WSA on tour". The head coach of the Werner Schlager Academy quickly recognized in the then 12-year-old Thai woman Tamolwan Khetkuen an exceptional talent. Good news for one of the starters of the Werner Schlager Academy. Coaches of the Werner Schlager Academy remain highly sought after. The European Table Tennis Championships in Herning, Denmark are history. From the perspective of the Werner Schlager Academy a unique success story. Wednesday and Thursday at the European Table Tennis Championships in Herning, Denmark the players from the second row are in the center. On 11 January 2011, the Werner Schlager Academy (WSA) was officially opened in Schwechat. As early as the late autumn of 2010, the Werner Schlager team was hard at work with the center’s activities. 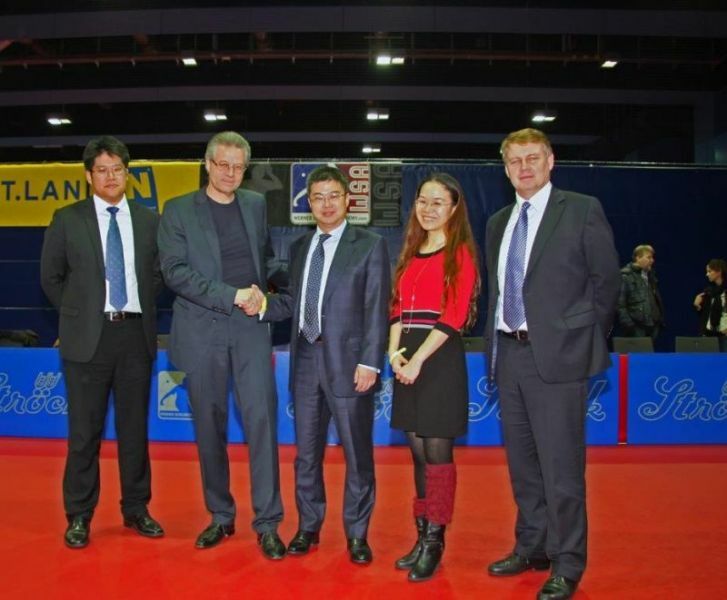 A new world-class Table Tennis Training Center in the heart of Europe had arrived. After two years, we look back with great pride on a sensational development. Austria's women table tennis champion SVS STRÖCK has reached, for the second time, the semi-final series in the European Champions League. In recent days a top-level ITTF meeting was held in the ITTF-Europe Office in the Werner Schlager Academy in Schwechat. The Werner Schlager Academy in Schwechat wrote again a little piece of history. Since the opening of the Werner Schlager Academy, the largest table tennis training center in Europe has provided a promising youth project with the International Table Tennis Federation. Great start for SVS STRÖCK star Daniela Dodean at the Volkswagen Cup in Huangshi (China). On Saturday, 22 September (starting at 10 o’clock), the 12th annual „Sports Day“ on Vienna’s Heldenplatz will take place. The Werner Schlager Academy bursting at the seams. A prestigious award for SVS STRÖCK star Daniela Dodean. The Werner Schlager Academy is evolving. Day by day. Since the founding of SVS STRÖCK in autumn 2010, everything is different in the Austrian and European women’s table tennis. With much grace, Austria’s men’s national team concludes their (Olympic) affair. Olympic Games in Sydney 2000 - Werner Schlager and a handful of colleagues are amazed when suddenly Microsoft founder Bill Gates mixed with the spectators. The STRÖCK European Youth Championship is history. At the close, the balance of the European Table Tennis Union was overwhelmingly positive. Today we finally met her. Nea Nika, the new little sunshine in Werner's and Bettina's life. Good performances were shown by the boy’s junior teams in the team competitions of the STRÖCK Europan Youth Championships in the Werner Schlager Academy in Schwechat. There already has been an incredible number of hits on the live ticker (http://tt-events.at/2012eyc/) of STRÖCK European Youth Championships in the Werner Schlager Academy in Schwechat. Austria's women table tennis champion SVS STRÖCK has been designated as the number two seeded in the Champions League season 2012/2013. Wednesday and Thursday were the scheduled days of arrival. Russia (with a 33 person delegation) as the first nation arrived in Schwechat, followed by the players from Sweden, Germany, Netherlands and France. Read more … Here we go . . .
Europe's youth table tennis is a guest in Schwechat. The European Junior Championships - the annual highlight for the best young players on the continent are here at the WSA. Friday the 13th is coming up, but do not worry. There is no calamity approaching. Quite the contrary: The STRÖCK Youth Championship is coming up. World and European champions; everywhere you looked, they were there. From Jorgen Persson to Zoran Primorac, Vladimir Samsonov to Werner Schlager, Adrien Mattenet, Bojan Tokic and Michael Maze to the Russian national team, the WSA was packed with the legends and the greats of the sport. Once again, the spacious training hall of the Werner Schlager Academy in Schwechat is just too small. Since Sunday, the top European stars are in the Academy to prepare for the Summer Olympic Games in London. 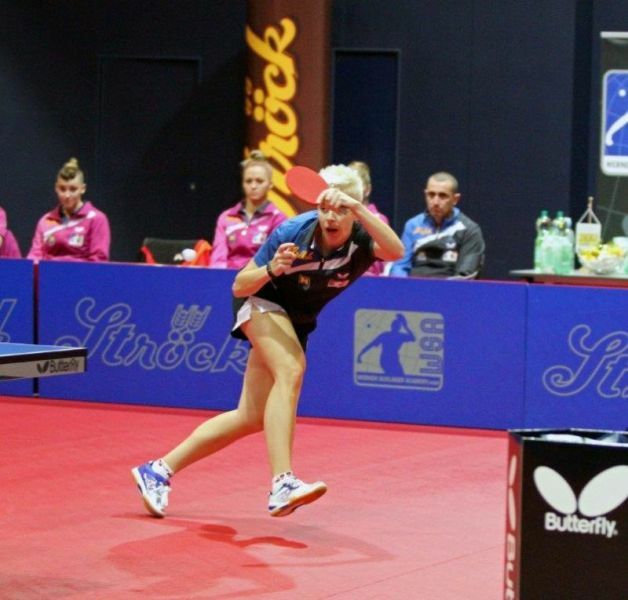 Austria's women table tennis champion SVS STRÖCK succeeded in the transfer market with a considerable coup. There will be an immediate effect on the finalists of the European Champions League with the addition of 15-year-old Tamolwan Khetkuen. Daniela Dodean, WSA-player with SVS Ströck on the Austrian team of last season’s national champion and finalist of the European Champions League, traveled today to the Mixed Doubles Championship in Buzau (Romania). Other highly acclaimed celebrity guests will be part of the European Olympic training course at the Werner Schlager Academy in Schwechat from the 1st to 7th July. On Friday in Saarbrucken, the draw for the men’s Champions League 2012/2013 was undertaken. The ÖTTV has released its latest rankings (junior class and overall). These rankings show the WSA-training group is clearly setting the tone. In exactly one month is the start: The European Youth Championships in the Werner Schlager Academy (13 – 22 July), prepared to break all records. 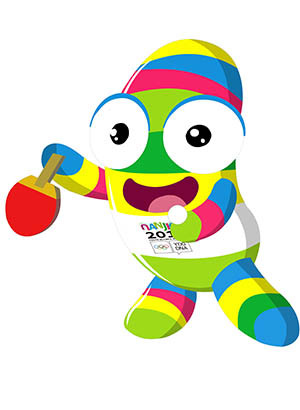 The Games of table tennis is fast approaching its ultimate climax: the 2012 Olympiad in London (July 27th – August 12th). Both seasons I and II have been completed since the founding of the WSA-association SVS STRÖCK. The Summer Olympic Games in London (July 27-August 12) are the absolute highlight of the sporting year 2012. WSA-partner association SVS Niederösterreich, for the 13th consecutive time, became the Austrian national table tennis team champions. Very much is on the line Monday, 21 May for the Austria women's table tennis champion SVS STRÖCK. Very much, indeed. This was the last major motivation before the assured Champion League's thriller on Monday against TTC Berlin Eastside (19.30 clock, Werner Schlager Academy / Mulversum Schwechat). 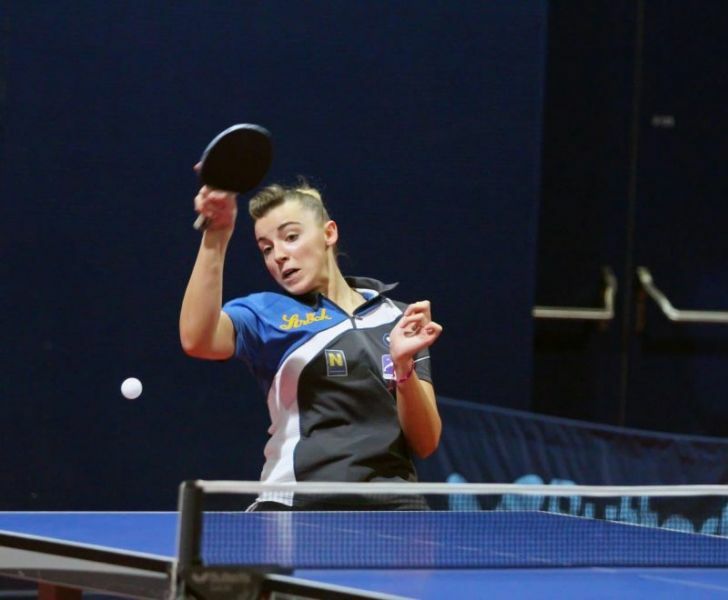 Austria's women table tennis champion is at the final leg of the European Champions League on Monday, 21 May (19.30 clock, Werner Schlager Academy / Multiversum in Schwechat) and is going to receive a very different kind of cooperation. Andreas Levenko, on board since the opening of the Werner Schlager Academy with his father, Dmitri (who works as a trainer here in Schwechat), one week after winning the Austrian Student Championships put a proper explanation point at the international level. Great success for two players from the international practice group of the Werner Schlager Academy. For the ladies, on Monday, 21 May at 19:30 in the Werner Schlager Academy (Multiversum in Schwechat) the title for the European Champions League will be decided. Europe's best women's table tennis club teams will face each other in the second and decisive final leg. This is extremely exciting. . . The competition between WSA-partner club SVS STRÖCK against TTC Berlin eastside in the final match-up in the European Champions League resulted in the closest of competition, with Berlin on top as thinly as can be imagined (2:3 in matches; 8:9 in games; 158:158 in points). Read more … This is extremely exciting. . .
At full strength, with Fan Ying (China), Austrian national champion Li Qiangbing, and Romanian champion and multiple European Championships medalist Daniela Dodean on staff for Austrian’s SVS STRÖCK, the team prepares for duty on Thursday at noon for the first leg of the finals of the European Champions League. On 12 and 13 May the next edition of continental comparison - the Asian Euro All-Star Challenge - takes place in Tianjin (China).ge. WSA-men's partner association SVS Niederösterreich won the cross-border Super League for the 13th time. The players of the national WSA training group put their stamp on proceedings in the Austrian Youth Championships in Herzogenburg, as expected. The Women's European Champions League for 2011/2012 is in the home stretch. WSA-partner association SVS STRÖCK and Germany's top team TTC Berlin Eastside will contest the final. It was a most successful weekend for the Austrian national and the international training group at the Werner Schlager Academy. And so for now, until the 2016 Olympic Summer Games in Rio de Janeiro, as part of the meetings at the World Team Championships in Dortmund, the cooperation and collaboration between the Werner Schlager Academy and its premium partner Butterfly have increased and been extended for another four years. A collaborative agreement among Shanghai University, the Chinese Table Tennis Association, the Werner Schlager Academy (WSA) and the ÖTTV has been secured to help create the future in table tennis. 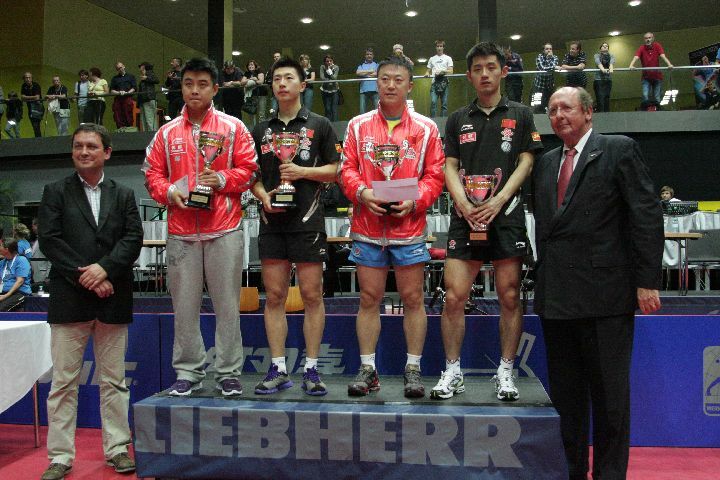 Austria's teams left an extremely strong impression in Dortmund at the LIEBHERR World Team Table Tennis Championships. On the occasion of the Table Tennis World Team Championships in Dortmund, the leading officials of the European Association ETTU with President Stefano Bosi and CFO Gonderdinger and the Austrian OC-Chiefs of the Youth Championships in the Werner Schlager Academy and the Multiversum Schwechat Rudolf Sporrer (ÖTTV) and Martin Sörös (WSA) signed the cooperation agreements. The LIEBHERR World Team Championships in Dortmund is coming. It begins on Sunday. The Chinese Table Tennis Association, Shanghai University and the Werner Schlager Academy are working on a collaboration for the future. 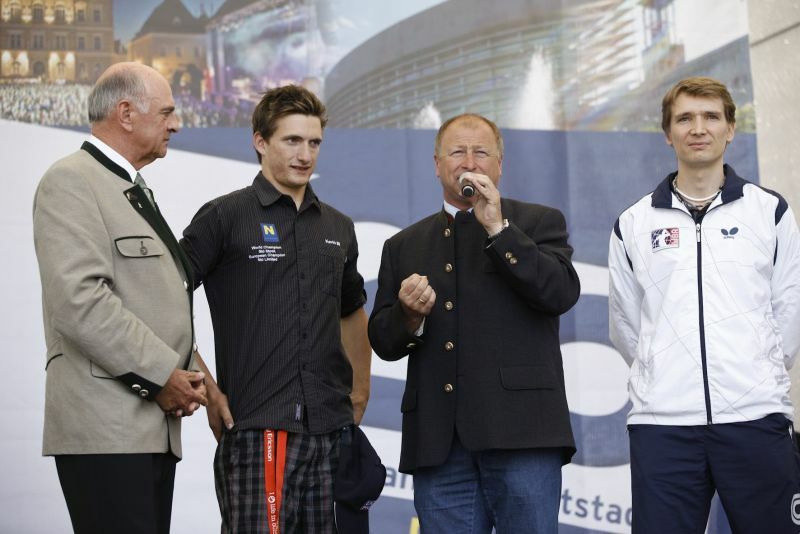 The Austrian Olympic Committee has announced the first nominations for Summer Olympics in London. Until the upcoming World Championships in Germany, up to 100 players from 22 nations are preparing for the competition at the Werner Schlager Academy. Only 19 days remain until the start of the World Team Championships in Dortmund, Germany. And in these 19 days, the Werner Schlager Academy in Schwechat will be bursting at the seams! The dates for the finals in the women’s table tennis Champions League between SVS STRÖCK and the German star squad TTC eastside Berlin are fixed now. Successful weekend for the players of the WSA-training group. Thailand's Tamolwan Khetkuen caught the eye of the Werner Schlager Academy in her first visit in 2009. As part of the WSA-on-week-tour in Lake Faak, Werner Schlager and the WSA trainers had no difficultly seeing the great talent hidden behind this young Thai woman. Austria's women's table tennis champions SVS STRÖCK, about a week ago, came up big in a thriller against Linz AG Froschberg and advanced to the finals of the European Champions League. At the contest in May (exact match dates not yet fixed) against the Star Ensemble TTC eastside Berlin, they will take the chance to create even more opportunity for offspring. WSA-partner association STRÖCK SVS has realized its dream by reaching the final. In an incredible Champions League semi-final thriller against Linz AG Froschberg in Schwechat the arch rival was defeated 3-2. Ticket sales for the unique Champions League double event on Friday, 24 February, in the Multiversum event hall of the Werner Schlager Academy in Schwechat are outstanding. The international networking of the Werner Schlager Academy extends to wider and wider circles around the world. In February alone, representatives from 21 nations were guests at the WSA in Schwechat. In 2011, to prepare for the World Championships in Rotterdam, China's National table tennis team trained at the Werner Schlager Academy. As they were very impressed by the experience, they are returning to the WSA to get ready for the 2012 World Team Championships in Dortmund (25th March to 1st April). Prestigious award for Richard Prause, the head coach of the Werner Schlager Academy in Schwechat. Since preparing at the Werner Schlager Academy for the Individual World Championships in Rotterdam in May, 2011, the Chinese National Team has done well. Impressively, they captured all the titles and dominated at the Worlds. The first full year of operations at the Werner Schlager Academy has now been completed. We can now, through the recently released new ITTF World Rankings, more readily understand the impact the Academy has had on the sport. Four actives are representing the international practice group of Werner Schlager Academy at the European Top 12 tournament in Lyon (France) this weekend. In January, 2012, athletes and coaches from 23 nations found their way into the Werner Schlager Academy. The global training center is becoming ever more international. On the occasion of the Chinese New Year the Werner Schlager Academy and the Austrian Chinese Business Association (ACBA) organized a nice social evening in the WSA. In the foyer of the Multiversum in Schwechat (Möhringgasse 2 – 4), tickets for the most spectacular Champions League double event on Friday, February 24th are available. 23 January 2012 - Welcome to the New Year. Welcome to the year of the dragon. On the occasion of Chinese New Year, the Werner Schlager Academy organizes, in cooperation with the Austrian Chinese Business Association, a nice get-together with partners, friends and networkers from and for China. With the opening tournament on 16 January 2011 the amateur sports project of the Club WSA started. At this tournament 120 players from several provinces and foreign countries were represented. Was it at the beginning, of course, pure curiosity, which drove many players in the WSA, this branch has now become a fixed part of the overall construct WSA. This was as exciting as it gets! More than three hours of table tennis at the highest level resulted in a 3:2 team victory for the Austrian women's table tennis champion SVS STRÖCK in the first Champions League semi-final match with archrival Linz AG Froschberg. The stakes are high for the WSA-partner clubs SVS Niederösterreich (men) and SVS STRÖCK (women) at the away games in the European Champions League on Friday evening. 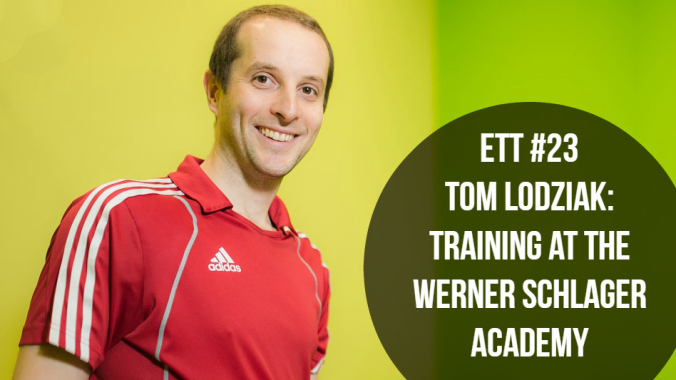 On 11 January 2011, the Werner Schlager Academy was officially opened in Schwechat: A World Table Tennis Training Center in the heart of Europe. After a year, we proudly look back at the Academy's sensational development from our point of view..
Austria's best junior players, all members of the international training group at the Werner Schlager Academy, all made giant leaps forward in the ITTF January Under-18 World Ranking list. The Austrian Association has released its latest national rankings. The players of the WSA partner clubs SVS Niederösterreich (men) and SVS STRÖCK (Women) indicating clearly the tone. A special treat is in store for the table tennis fans on Friday, 24th February in the Werner Schlager Academy in the Multiversum – Schwechat with the great opportunity of a Champions League double header. There is expected high attendance at the Werner Schlager Academy in Schwechat in early January. The Fakel Gazprom Orenburg star ensemble from Russia and, without a doubt, in this season a first rate candidate for the Men's European Champions League are coming to the WSA in Schwechat to prepare for the League's quarter-final match in Pontoise (France) on January 13th. The WSA-ladies partner club SVS STRÖCK is already in the semifinals of the European Champions League; now the second WSA partner team, the SVS Niederösterreich men's team has made an important step in this direction. WSA-partner association STRÖCK SVS has passed another sporting milestone. In its first year of participation in the European Champions League, Austria's women's champion team won the preliminary round Group A competition, thus reaching the League's semi-finals. The WSA-partner club remains on the road to victory in the Women's European Champions League with a three-set win in the Group A preliminary round. The European Championship 2013 has begun. . . The 2013 European Table Tennis Championships (4th - 13th October) held in the Werner Schlager Academy (WSA) in Schwechat has started. Read more … The European Championship 2013 has begun. 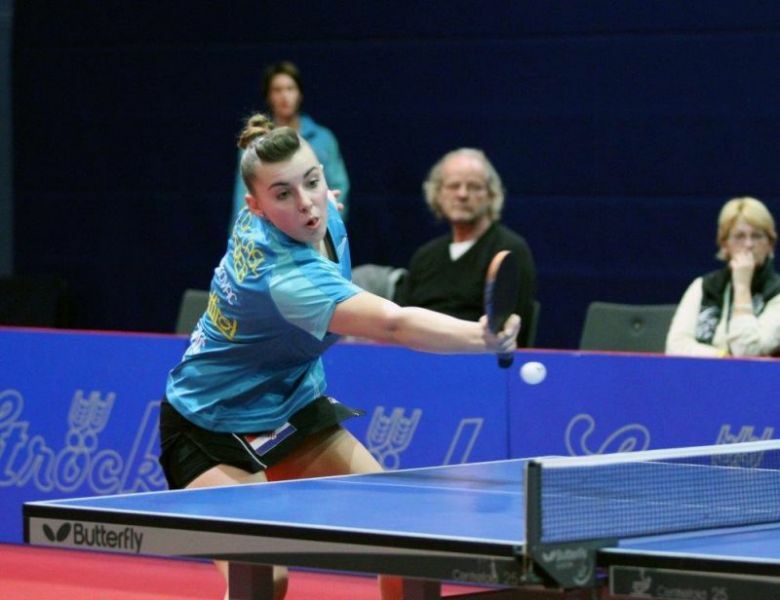 . .
Daniela Dodean, continuously training at the Werner Schlager Academy from the beginning and star player for the partner affiliated SVS STRÖCK team has qualified directly to the European top 12 (February 4- 5 2012 in Lyon) via the December ITTF world rankings. Ma Long and Ding Ning (both China) lead the ITTF World Rankings in December. For Austria and the training community at the Werner Schlager Academy this month also provided encouraging news of the upper movement of team members Stefan Leitgeb and Simon Pfeffer. The group matches in the cross-border Super League are completed and both WSA-partner clubs have - as expected – fixed the win in their preliminary round groups. Great success for Austria's best table tennis doubles Robert Gardos / Daniel Habesohn. Success for WSA-partner association STRÖCK SVS! With a 3 – 1 victory in an away match against Gumotex Breclav in the European Champions League, the team is headed for the semi-finals. Entertainment guaranteed. Top table tennis guaranteed. Fascination guaranteed. The WSA-partner association SVS STRÖCK seeks to deny Breclav (Czech Republic) on Breclav's home court on Friday (18:00) in the second group match (Group A) in the European Champions League. On Friday, 18 November, WSA partner club SVS STRÖCK strives for success in Breclav (Czech Republic) in their second match in the Champions League preliminary round in Group A. In their first encounter against Breclav, the Austrian ladies champion won 3 – 0. For the first time since its opening in early 2011, Niederösterreich's Governor Erwin Pröll (ÖVP) visited the Werner Schlager Academy. Austria's men's national team (Werner Schlager, Robert Gardos and Chen Weixing) has improved one position in the ITTF JOOLA Team world rankings, moving from sixth to fifth place. The players of the (inter-)national WSA training group have achieved some outstanding leaps upward in the latest ITTF world rankings. The PTT European Championships took place from the 19th to the 29th of October in Split (CRO). Gold was won by Andreas Vevera in Class 1 and Stanislaw Fraczyk in Class 9. Great success for the Werner Schlager Academy key players Robert Gardos and Daniel Habesohn. 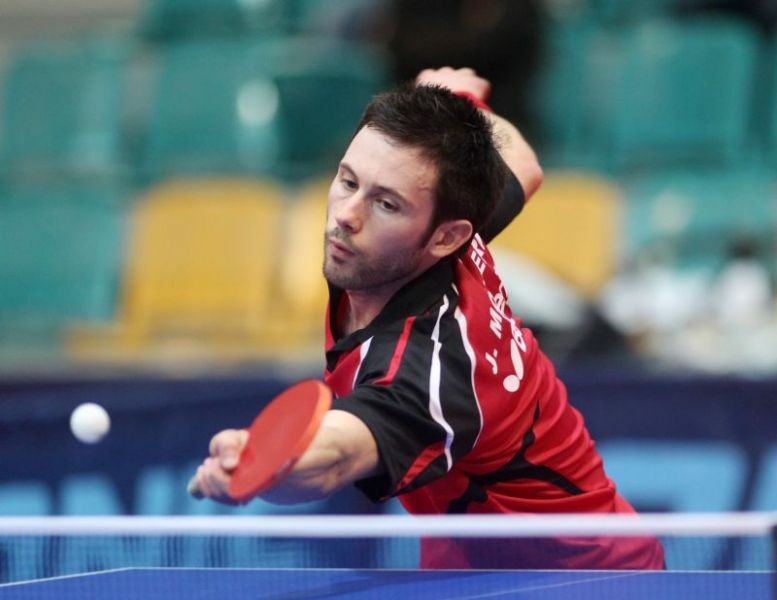 The European Table Tennis Championships in Gdansk are now history. For the WSA (with many happy partnership discussions with equipment vendors and numerous responsible ETTU associations), these championships were a sporting success. A big success for SVS-STRÖCK star Daniela Dodean at the European Championships in Gdansk. Great achievements for the Werner Schlager Academy players at the European Championships in Gdansk. Excellent results were attained by the international training group from the Werner Schlager Academy so far in the Team Event of the 2011 European Championships in Gdansk. 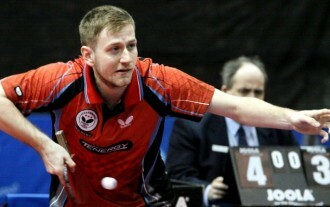 Saturday in Gdansk, Poland starts the 2011 European Table Tennis Championships. What an impressive debut in the Champions League by Austria's Women's Champion SVS Ströck ! Gdansk, Poland hosts the European Championships, starting on Saturday, with Austria sending a strong contingent of seven players. On Monday at 19:30 in the WSA Hall, Austrias' highly acclaimed table tennis champion team SVS STRÖCK makes its debut in the European Champions League against the strong Czech team Gumotex Breclav in Group A action. On Monday at 19:30 the WSA Hall will be ready: Austria's women's table tennis champion SVS STRÖCK competes in its first match in the European Champions League. Day by day, the Werner Schlager Academy is growing and growing as the international response to this major ITTF World Training center is nothing short of tremendous. The Chinese Ma Long and Ding Ning are the Austrian Open Champions, an event held at the Werner Schlager Academy in the Multiversum in Schwechat. There was a particular high tension that was created in the World number one arithmetic prior to the first rally in the men's singles final at the Austrian Open in Schwechat. The winner in China's internal battle between Ma Long and Zhang Jike would decide who the new World number one would be in the October ITTF rankings. Being in amazing shape, the players from the international WSA-training group presented very well in the qualifying rounds of the Austrian Open at the WSA in Schwechat. The ITTF Pro Tour in the Werner Schlager Academy in Schwechat – the door is the handle to the table tennis world. Fortune did not favor local hero Werner Schlager in the draw of the Austrian Open (21 – 25 September. For the tournament in the homeland of the 2003 World Champion in the Werner Schlager Academy located in the Multiversum in Schwechat was randomly assigned as the number 17 seed to play a qualifier in the first round. However, in the next round he plays no less than the reigning World Champion Zhang Jike. The international table tennis stars have arrived; the preparatory work in the Werner Schlager Academy and the Multiversum in Schwechat is nearly complete. It is done for the best table tennis players in the world! The shuttle drivers are very busy; the hotels are checking in the customers diligently. Table tennis players from 49 countries are approaching Schwechat, from 21 – 25 September, to attend the ITTF Pro Tour tournament at the Werner Schlager Academy in the Multiversum. So now it's official. China's table tennis magician are sending their very best of the best onto the ITTF Pro Tour tournament (21 – 25 September) at the Werner Schlager Academy in the Multiversum in Schwechat. Each table tennis fan clucks his tongue while reading the entry list. The ITTF Pro Tour tournament in Schwechat (21 – 25 September) stands at present as the best selling tournament of the year, with the stars from China leading the seedings. The September 21 – 25 Austrian Open in the WSA at the Schwechat Multiversum will have an unprecedented number of stars. Nine weeks of summer can be quite a long time were it not for the inaugural Holiday Games at the WSA for the junior Schwechaters adding entertainment and a good mood. Though it is still summer, the international table tennis season is slowly coming to an end. The last really big highlight from the European perspective is the European Championships in Gdansk, Poland – October 8 – 16. On the way to these Championships is Schwechat. The organizers of the Austrian Open – September 21–25 – have achieved a remarkable coup. The Liebherr Group, for many years a major participant in international table tennis events, has become the major sponsor for this $122,000 ITTF Pro Tour event. With the nomination of 17 players, the Austrian Table Tennis Association has a full contingent of representatives for the September 21 – 25 ITTF Pro Tour event at the WSA in the Multiversum in Schwechat. 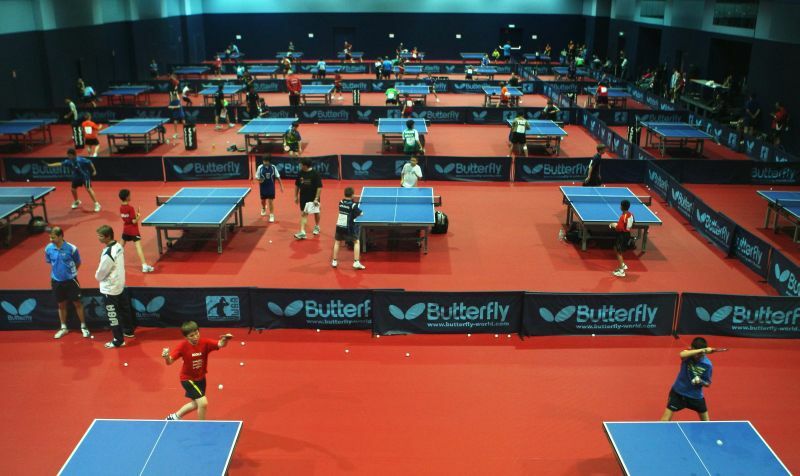 For the first time, from September 21 – 25, 2011, an ITTF Pro Tour event will be held at the newly established Werner Schlager Academy in the Multiversum located in the Austrian city of Schwechat, on the outskirts of Vienna. And now, news has arrived that makes the table tennis heart beat faster. Between September 21 and 25, the Earth is not flat; and it is not a rotational ellipsoid. At least in and around Schwechat, it is simply a table tennis ball. WSA-player Simon Pfeffer continues to climb the ITTF World Rankings following his strong results in the European Youth Championships in Kazan (especially in the team competition), with the latest gains coming in the August rankings list. There is no sign of a lazy summer at the Werner Schlager Academy. The cross-border Super League defending champion's SVS STRÖCK begin with their first round travels. It is still about two months until an absolute highlight of competition in 2011. From 21 – 25 September, the $122,000 ITTF Pro Tour event will be held at the Werner Schlager Academy in the Multiversum in Schwechat. The conclusion of the Team events at the European Youth Championships in Kazan, Russia established the rankings of the Austrian youth teams. 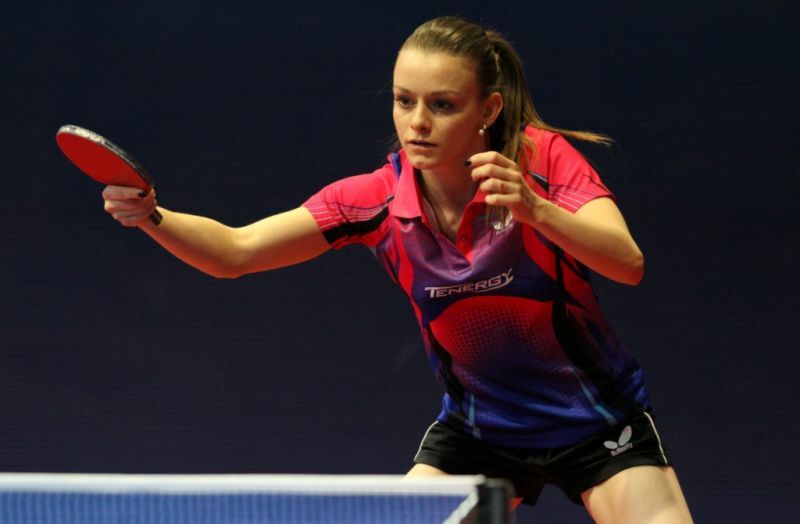 On Friday, the European Youth Table Tennis Championships began in Kazan, Russia. Austria and the Werner Schlager Academy have a strong team participating, for the first time being represented by the new youth officer ÖTTV-Günter Plattner. Only 365 more nights of sleep, then the time will be at hand. On 13 July, 2012, the European Youth Championships will begin at the Werner Schlager Academy in the Multiversum in Schwechat. 25 years St. Pölten – thus the governor of Lower Austria, Erwin Pröll invited Austria's Table Tennis World and European Champion Werner Schlager to the anniversary party in St. Pölten. The final phase of preparation for the European Youth Championships in Kazan, Russia (15 – 24 July) has begun. Austria is represented in all four categories (Under 18 boys and girls; Under 15 boys and girls). 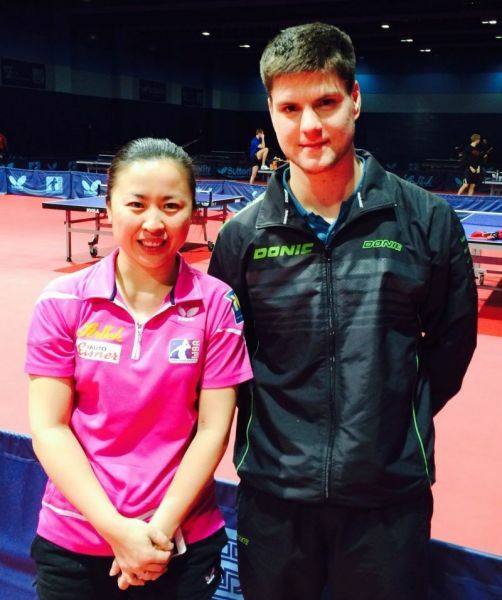 ITTF JOOLA has released its latest team rankings. Again, the ÖTTV junior hopeful Nicole Galitschitsch has improved her world ranking again with the ITTF July report. The 17 year old, who will compete next season for SVS STRÖCK, improved an amazing 126(!) places to reach a ranking of 385, a career high. The WSA partner-association SVS STRÖCK has now been registered for the upcoming season in the cross-border Super League. The ITTF World Hopes Week in the Werner Schlager Academy in Schwechat moved to the tournament phase on Saturday and Sunday. For the next highlight in the ITTF World Hope's Week at the Werner Schlager Academy in Schwechat, Dane Michael Maze and Hungary's Women's European table tennis champion Kristina Toth provided the excitement in a meet and greet with the kids from around the world. The Werner Schlager Academy in Schwechat is bursting at the seams. In the WSA Training hall, 36 tables are set up for the kids with an additional 15 tables in the Multiversum Event hall. WSA Head coach Richard Prause is flying to Shanghai early Wednesday. With 78 players from 32 countries participating in the first ever ITTF World Hope's Week, hosted by the Werner Schlager Academy, Schwechat once again becomes the world's center for the sport of table tennis. 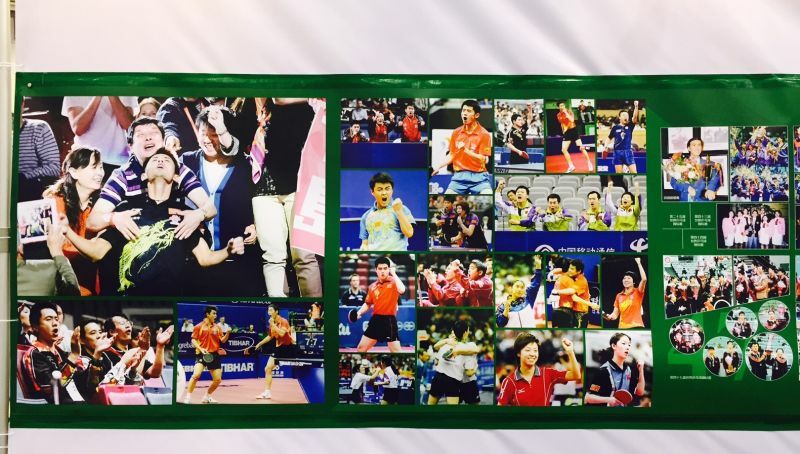 For the first time ever, the international governing body of table tennis, the International Table Tennis Federation (ITTF) will be organizing the World Hopes Week, featuring players born in 1999 through 2001. Hosting this event is the Werner Schlager Academy in the Multiversum in Schwechat. In the seminar room in the Multiversum in Schwechat, the draw for the European Champions League for both the gentlemen and the ladies was made. Recently the WSA partner club SVS STRÖCK announced the commitment of Chinese national team member Feng Yalan to the team for next season. She will be the top star for the newly crowed Austrian team champion, a most notable designation. The European Table Tennis Union (ETTU) will make the Werner Schlager Academy and the Multiversum in Schwechat the center of European table tennis for two days. Even in the first season after the founding of the WSA partner club SVS STRÖCK, this team has taken over the Austrian women's table tennis, a feat that broke the 14 year dominance of Linz. It was in the spirit of the youth this weekend in the Werner Schlager Academy at the Multiversum in Schwechat. Read more … Junior Success! In the Multiversum in Schwechat, on Friday, Saturday, and Sunday at the Werner Schlager Academy, top young players will be on display. The changing of the guard is complete. After 14 years of dominance by Linz, the Werner Schlager Academy's women's team SVS STRÖCK has, in its first season, secured the women's league title. 12 Titles in a Row! WSA partner men's club SVS Niederösterreich has won, for the 12th time in a row, the Austrian Table Tennis Championships. Read more … 12 Titles in a Row! A Prestigious Award for Richard Prause, head coach of the Werner Schlager Academy in Schwechat. 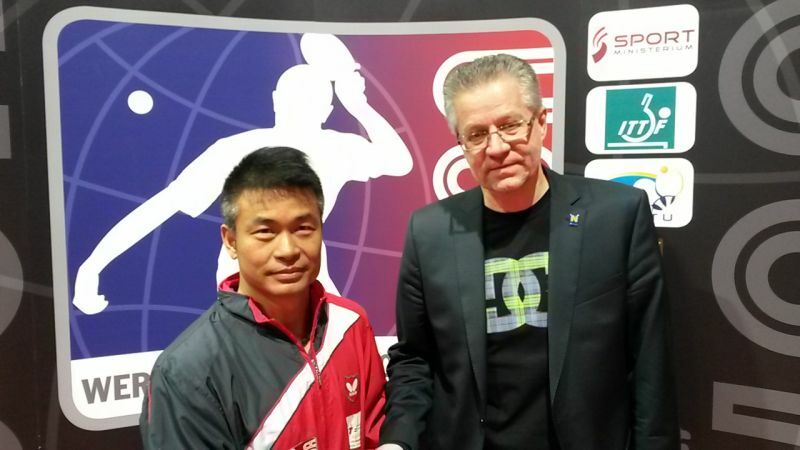 Richard Prause has been selected by the ITTF as the coach of the World team to compete against the great world champion China in Shanghai on 24 – 25 June. As well as the SVS Ströck ladies also the second WSA-partner club SVS Niederösterreich (men) reached the final of the Austrian Team Championship in a sovereign manner. Great success for the WSA partner club SVS STRÖCK. In the very first season this team, the Austrian women singles champion Li Qiangbing, the Romanian superstar Daniela Dodean and Taiwan's Huang Yi-Hua No. 1, reached the final of the Austrian Team Championship. Surprising and important visitors arrived at the Werner Schlager Academy. China's living table tennis legend Zhang Yining, the best table tennis player of all time, four-time Olympic champion, ten-time World champion, four-time World Cup winner, 46-time winner on the ITTF Pro Tour, Asian champion and between 2003 and 2009 almost consistently the number one in the women's world rankings, included in her visit to Austria a trip to the Werner Schlager Academy. During 18 – 26 June at the Werner Schlager Academy in the Multiversum in Schwechat a table tennis world premiere will be held: For the first time ever, the ITTF (now ranked as the second-largest sporting federation with 215 member nations) is organizing the World-Hopes-Week and selected the Werner Schlager Academy for its location. The WSA-partner associated teams of SVS STRÖCK (women) and SVS Niederösterreich (men) will contest in the semifinals of the Austrian Team Championships in the Werner Schlager Academy at the Multiversum in Schwechat against TTC Villach (women) and Mauthausen (men). Admission is free. Today - one day after the World Cup in Rotterdam – the released world rankings made it clear. It made clear which 28 players receive their direct starting place for the 2012 Summer Olympics in London. For the stars of the Werner Schlager Academy it’s time to celebrate. In the week before the World Cup in Rotterdam, China's table tennis aces practiced and prepared in the Werner Schlager Academy. For the Chinese women team at the World Cup the preparation camp in the Werner Schlager Academy obviously was the perfect decision. The International Table Tennis Federation ITTF is now the second largest sports federation in the world. ITTF President Adham Sharara announced during the World Cup in Rotterdam, that, with Wallis & Futuna, Curacao / Netherlands Antilles, Tokelau, Antigua / Bardbados, Mozambiqu, British Virginia and Iceland, new national associations have been included into the World Federation. One of the busiest men at the World Cup in Rotterdam is certainly WSA Head coach Richard Prause. This Sunday the 48th World Table Tennis Championship started in Rotterdam. The final phase starts during the mid of this week, the finals are scheduled next weekend. In order to help the victims of the earthquake in Japan the WSA, in cooperation with the partner club SVS Niederösterreich, decided to donate a part of the revenue from the Champions League Semifinal between SVS Niederösterreich and Borussia Düsseldorf on April 6th. China's table tennis superstars have arrived in Rotterdam, where the GAC Group World Table Tennis Championships will open on Sunday. Giving them strength was a training week in the Werner Schlager Academy located in Schwechat, an experience that left deep impressions. The men's team of WSA partner club SVS Lower Austria has a real chance to win again the cross-border Super League. Friday evening the China's national table tennis team arrived in Schwechat for the purpose of preparing for the ITTF World Championships in Rotterdam (8 – 15 May) at the Werner Schlager Academy. On Friday, 29 April China's Super Stars will arrive at the Vienna-Schwechat airport. The most recent ITTF World Ranking list brought another clear improvement in the WSA youngsters Stefan Leitgeb (Tirol) and Simon Pfeffer (Vienna). There are tremendous expectations for China's team at the World Championships in Rotterdam (8 – 15 May), for they may win (if possible) everything. Their path to the Netherlands, as reported, travels over the Werner Schlager Academy. It is in Schwechat that the China aces will have their final preparations. About seven months after establishing WSA partner club SVS STRÖCK won its first major title (and besides, it is an international one). The WSA-partner club SVS STRÖCK will compete on Wednesday (17:00) in the Werner Schlager Academy in the first of the final matches for the title in the cross-border Super League. As the 2010/2011 Champions League season turns into the home stretch, we gaze in the direction of next season. In early September (men) and the end of September (women), the 2011/2012 Champions League begins. It is the big hit of the year - SVS Niederösterreich against the Champions league defending champion Borussia Dusseldorf on Wednesday (20:15) in the Multiversum in Schwechat. 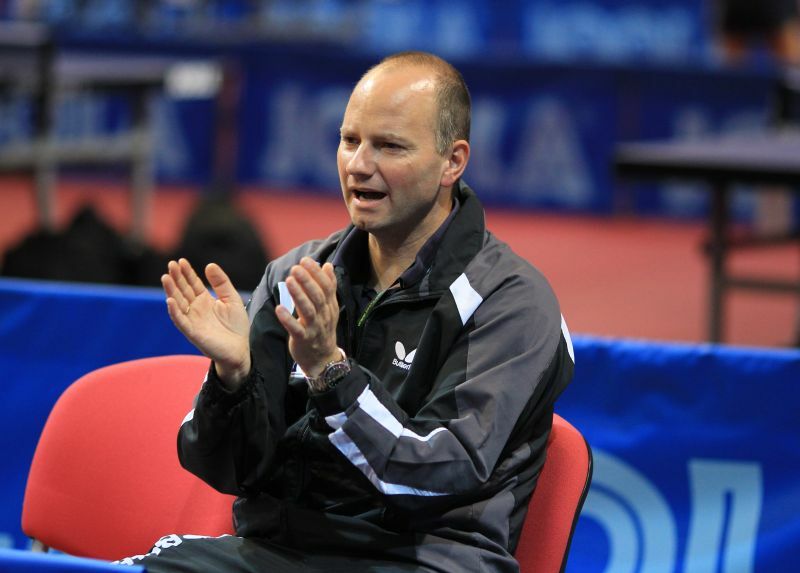 From 2004 to 2010, Richard Prause was the coach of the German Men's National Table Tennis Team. Under his leadership, the team attained an Olympic silver medal, two silvers in the World Championships, and eight European Championship golds. While China may send only seven players to the individual events in Rotterdam (8 – 15 May) for the World Championships, Austria will be nominating five players for the individual events. A large contingent from the Werner Schlager Academy is being represented at the World Championships in five weeks time. After much preparation, the ITTF [International Table Tennis Federation] has brought the new „Hot Spots ITTF Training Center Network“ to life. The purpose of this project is to optimize the training network among the 211 member-nations of the ITTF and link the countries, institutions, and athletes together. The junior athletes in the Werner Schlager Academy training group left an impressive stamp on the Youth National Championships in Telfs. At the World Championships in Rotterdam (8 – 15 May), many are evaluating China's attainment of gold (again). In the order of things, it seems it is about wins and losses. Often, it is only the difference of a few millimeters that determines who wins or loses points in the world rankings. And then, suddenly, it all becomes secondary. You turn on the TV and you are shocked by what you see. It is sad and you are stunned. On Wednesday, 6 April, a real treat is in store for the table tennis fans as the Multiverse in Schwechat will host the semi-final round of the Champions League between SVS Niederösterreich and the defending champion Borussia Dusseldorf. Outstanding success for the WSA partner club SVS STRÖCK! An outstanding performance by the WSA-partner association SVS STRÖCK in the first leg of the semi-final matches puts one foot into the finals of the cross-border Super League. It was a festival of success for members of the Werner Schlager Academy training group at the 2011 Austrian Championships in Wels. The young Tyrolean Stefan Leitgeb has swung through a sound barrier. This year the newly formed SVS STRÖCK team has achieved a fine accomplishment, the semi-finals in the cross-border Super League Championships. 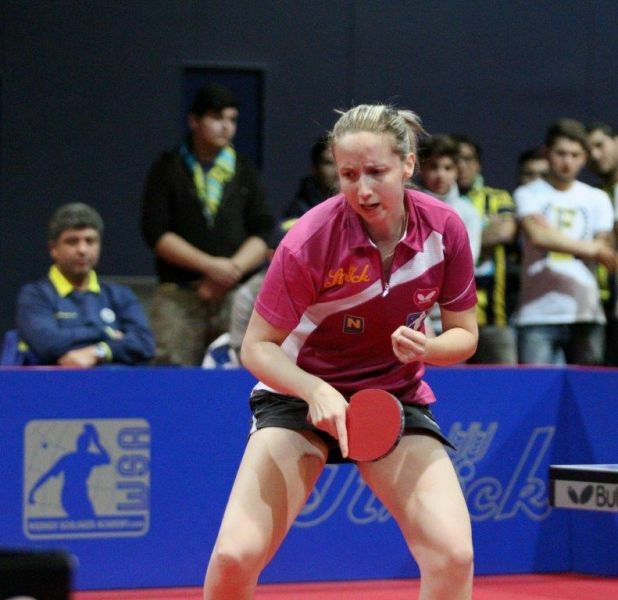 One of Austria's finest young hopefuls, Nicole Galitschitsch, continues her climb in the ITTF World rankings, moving up an impressive 91 places in the March ranking list, to number 514. The Hyundai Euro-Asia Challenge will be held on Tuesday and Wednesday in the Chinese capital of Beijing. As the ITTF Individual World Championships in Rotterdam (8th - 15th of May) approaches, fewer opportunities are available for players to measure themselves against the best prior to this event. Next week, at the ITTF German Open in Dortmund (23rd - 27th February), this tournament offers the last test before the World Cup. Virtually all the top stars will be participating in both events. WSA head coach Richard Prause is currently wearing the training suit of the Iranian club. In autumn 2010, the Werner Schlager Academy signed an agreement (initially until the 2012 Olympics) with the Iranian club. The Austrian club has just published its youngest up and coming rankings. The WSA is still young. Provisional training was started in September 2010 (in a school near the Werner Schlager Academy). Werner Schlager reached 3rd place in the European Top 12 tournament in Lüttich. From February 14 to 21, an ITTF training camp will be held in the Werner Schlager Academy with young talents from all over the world. In 2011, the WSA hosts international highlights like the JOOLA-European Nations League (4.1.2011), the UNIQA-Youth Top 10 (28.-30.1.2011) as well as the Austrian Open/ Pro Tour (21.-25.9.2011).